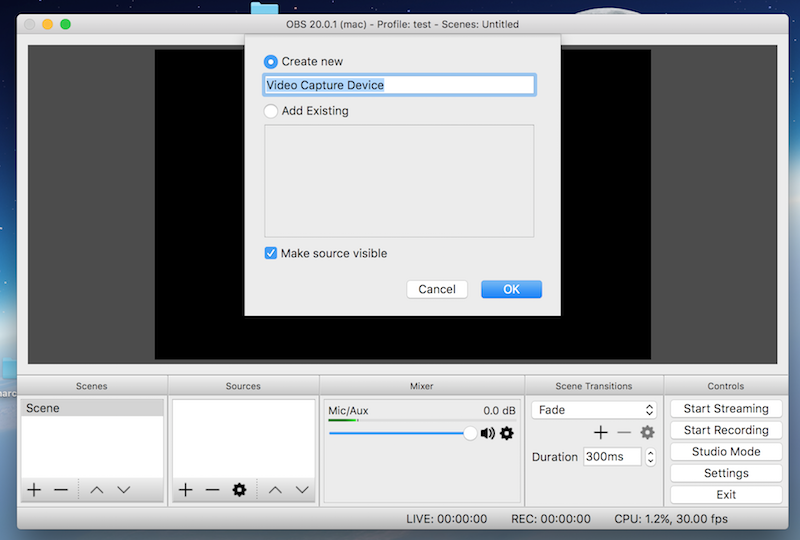 Start a video capture software. Here we will use the bundled-in PhotoBooth app that is in your Applications directory. You can also try VLC, Skype, Facetime, etc. 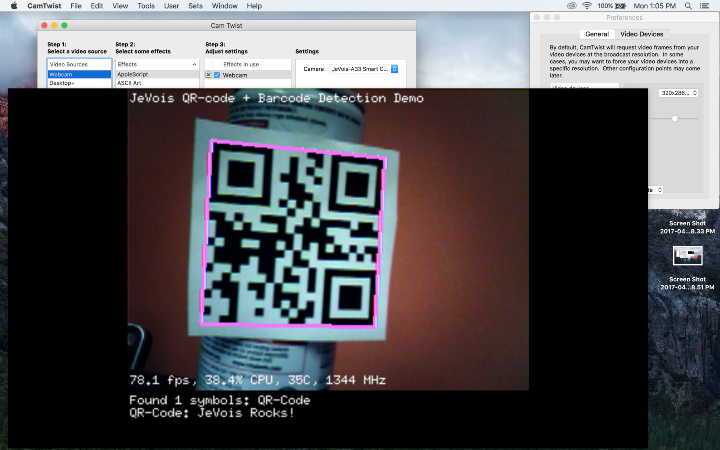 The built-in Photobooth app is very picky and will refuse to use the camera if the camera exposes BAYER or RGB565 video modes, too many modes, etc. It also does not allow you to select video resolution. 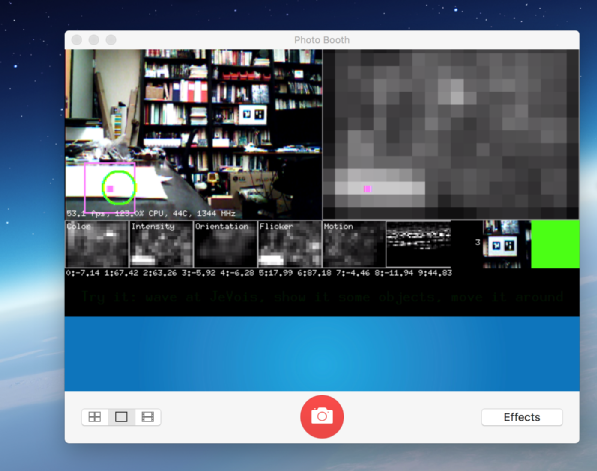 To use the JeVois camera on a mac it is recommended that you configure it with only one available video resolution (one entry in your videomappings.cfg file). See UserModes for more info. Open Broadcaster Studio is a great free program that allows you to select different video resolutions, as needed by JeVois. Install it, during installation, just say that you will not be streaming video. 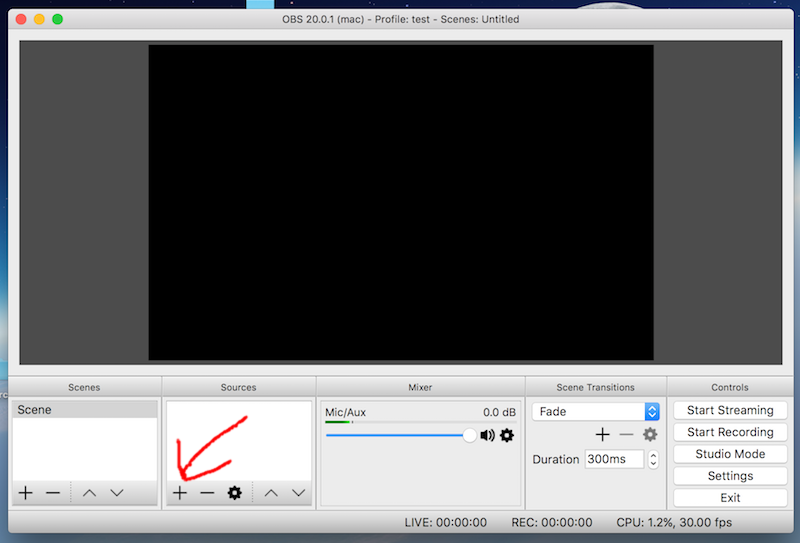 Open OBS Studio, towards the bottom left of the screen, click the + icon under Sources to add a new video capture device. 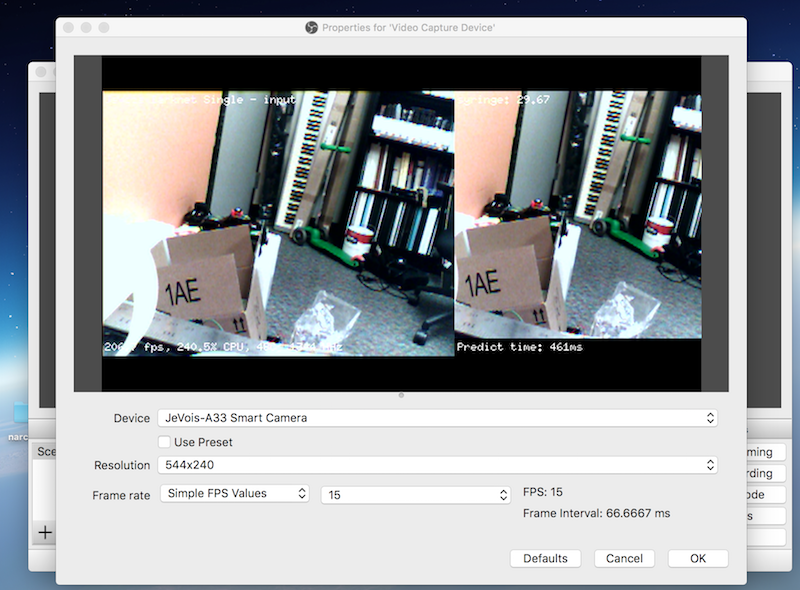 Select the Jevois-A33 Smart camera as its device, uncheck Use Preset to enable all JeVois resolutions, pick a resolution that you want to try out, select Simple FPS Values, and pick one of the available FPS values. FPS: when you change resolution, sometimes you will be offered some Rational FPS values, but it is simpler to just switch back to Simple FPS values and pick one that JeVois is offering. Selection of different machine vision algorithms is achieved by selecting different video resolutions in your video capture software. 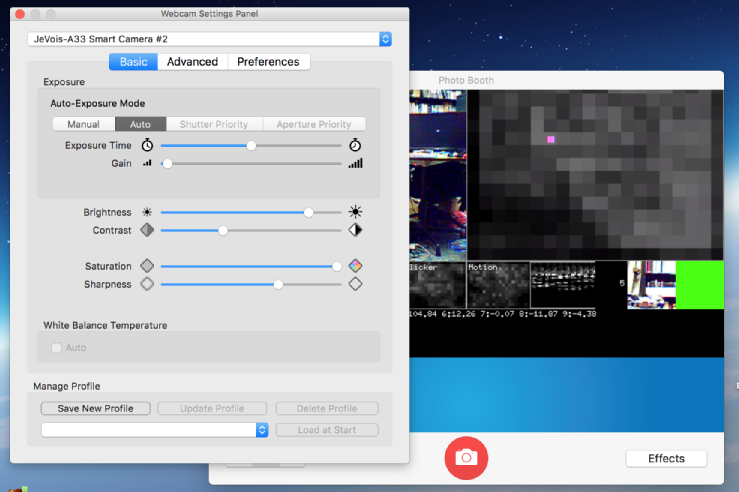 On Macs, most webcam apps do not allow you to select video resolution. But a few do. One example is CamTwist Studio. 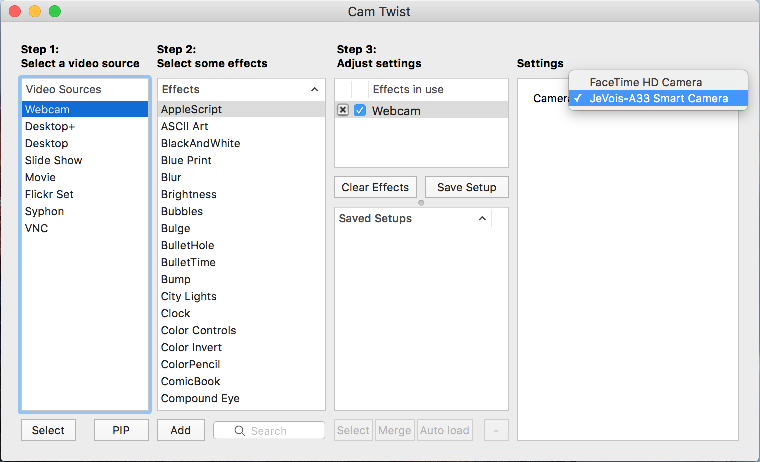 Download CamTwist Studio. We used the latest (development) version and it worked great on our El Capitan Mac. Install it on your Mac. 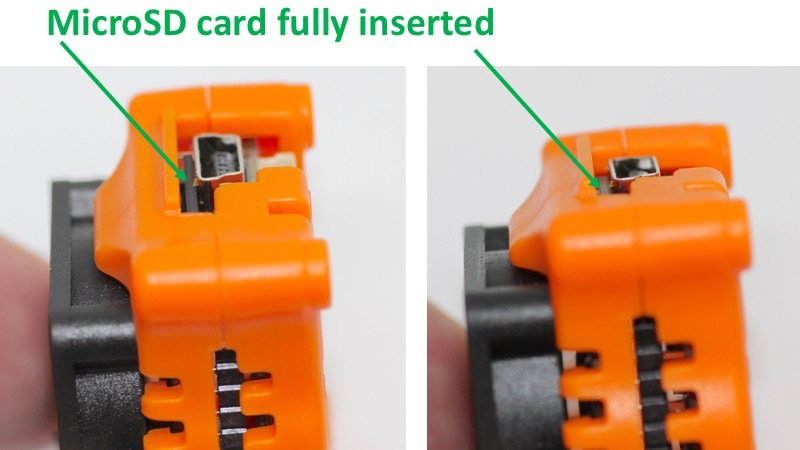 Plug in your JeVois camera, wait for orange LED flash and then solid orange LED. 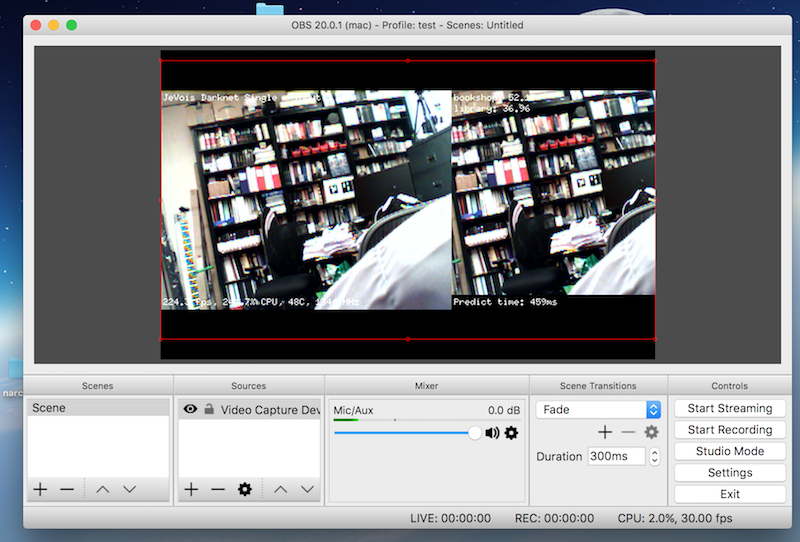 In the CamTwist window, double-click on Webcam under 'Step 1: Select a video source'. 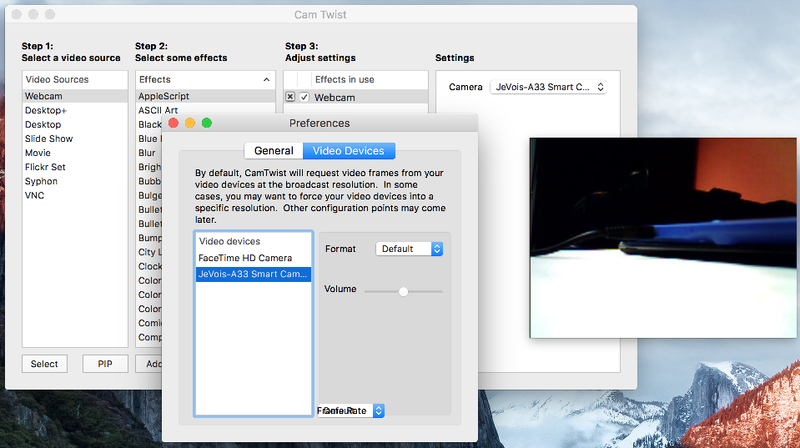 Then under Settings at the right of the CamTwist window, select the 'JeVois A33 Smart Camera'. On the menu bar at the top of the screen, select View -> Preview. This should show live video from your JeVois smart camera. The frame rate is not great, but that will be fixed below.By default, the resolution is 320x240 in MJPEG with no processing on the JeVois smart camera (i.e., it behaves like a regular camera). On the menu bar at the top of the screen, go to CamTwist -> Preferences. Click on 'Video Devices' towards the top of the preferences window. Then select the JeVois-A33 Smart Camera. Finally, use the Format pull-down menu to select various resolutions. 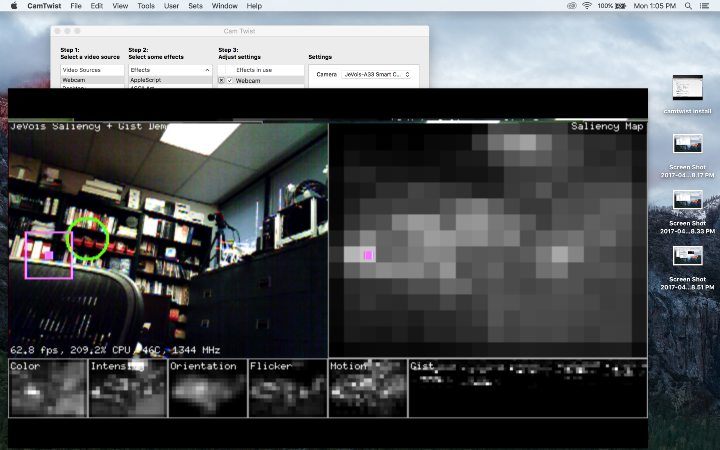 Each time you select a new resolution, it will also select a different machine vision algorithm on your smart camera. See JeVois Start, under 'Demos' for a list of the default video mappings (which algorithm runs on JeVois depending on which resolution you select in CamTwist). Under General in the Preferences window, you can change frame rate and resolution of the preview box. You need to restart CamTwist after the change. You will also need to manually drag the corner of the preview window to its full new size. (assuming you saved ffplay into your ~/bin/ directory). Note that on Mac, the latency (delay or lag between capture and display) is horrible with many video capture apps, including ffplay. This is not a limitation of JeVois. When used with a Linux host, there is no lag.